Koni Sport shocks are the best performing shock absorbers on the market today. 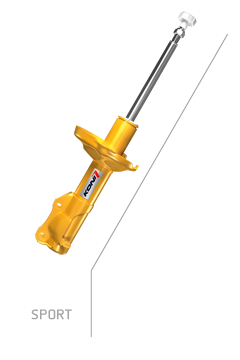 The Koni Sport Yellow shocks and struts are the single greatest improvement you can make to your car's handling performance. Featuring adjustable valving and specifically designed to work with lowering springs, sports car owners worldwide know and love the Koni Yellows. Dial in your sports car's performance to squeeze every bit of performance out of it! When you're on the track, you know that a few miles per hour in a corner can make the difference between a win and a loss, so the ability to adjust your suspension is crucial to success. Koni Sport shocks have a 100% range of adjustment, up to three times as much range as other adjustable shocks. That means that you have more options for finding the perfect level of damping for exactly your driving style and the type of roads you're driving on. The huge range of adjustment allows Koni Sport Yellow shocks to provide an OEM-like ride at their softest setting or a race-ready stiffness at the highest. Koni Yellows give you performance when you need it, comfort when you don't. Whether you're a competitive racer, a weekend warrior, or just an aggressive driver, the Sport will transform your sports car into a race ready corner eating beast. Check out our guide for how to adjust your Koni shocks.